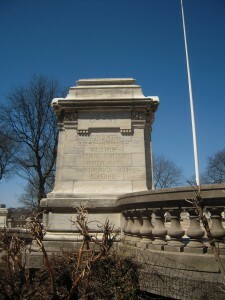 The Soldiers’ and Sailors’ Monument is located at West 89th Street in Riverside Park, Manhattan. It was built to commemorate Union (Northern) soldiers who died in the Civil War. The monument was unveiled by then-governor, Theodore Roosevelt, in a ceremony featuring surviving veterans, in 1902. Its design was based on ancient Greek architecture. There is a door to enter the monument, but the public may enter only once year on Openhousenewyorkday. 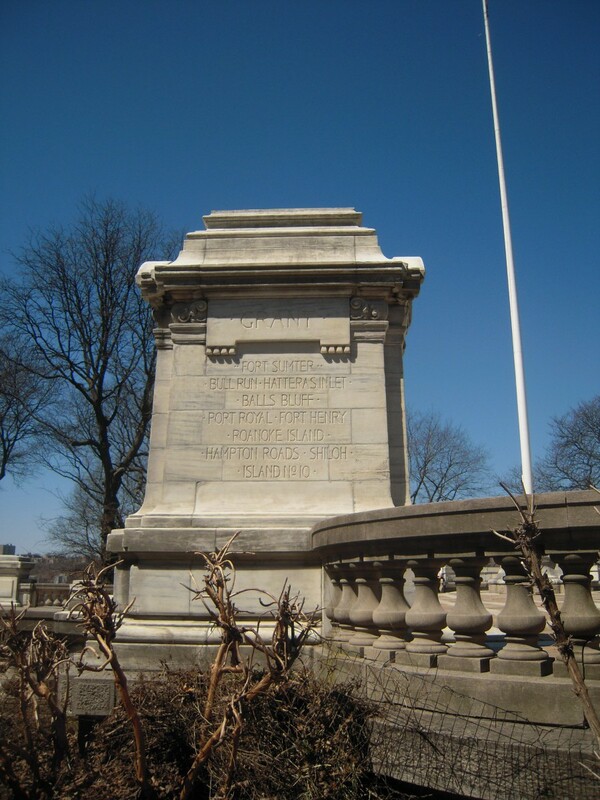 There are inscribed plinths leading up to the monument that contain the names of Union generals, New York volunteer regiments and the battles they fought in. Here is the plinth devoted to Ullyses S. Grant, whose own tomb is just up the street. I adore The Soldiers’ and Sailors’ memorial. It is solemn and beautiful and it provides many seating areas with gorgeous views of the Hudson River and the park. It is the perfect place to reflect on the many lives lost in the war to preserve our nation and the sacrifice of too many of our armed forces, then and now. This entry was posted in Uncategorized on April 9, 2014 by Mary Sue Donsky.